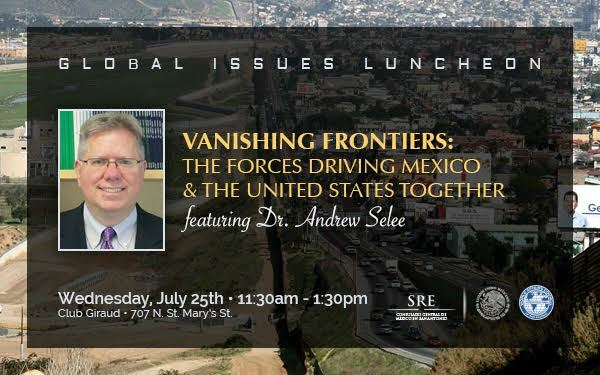 Join the World Affairs Council of San Antonio for a luncheon featuring Dr. Andrew Selee, President of the Migration Policy Institute and expert on Mexico, immigration, and US-Mexico relations. 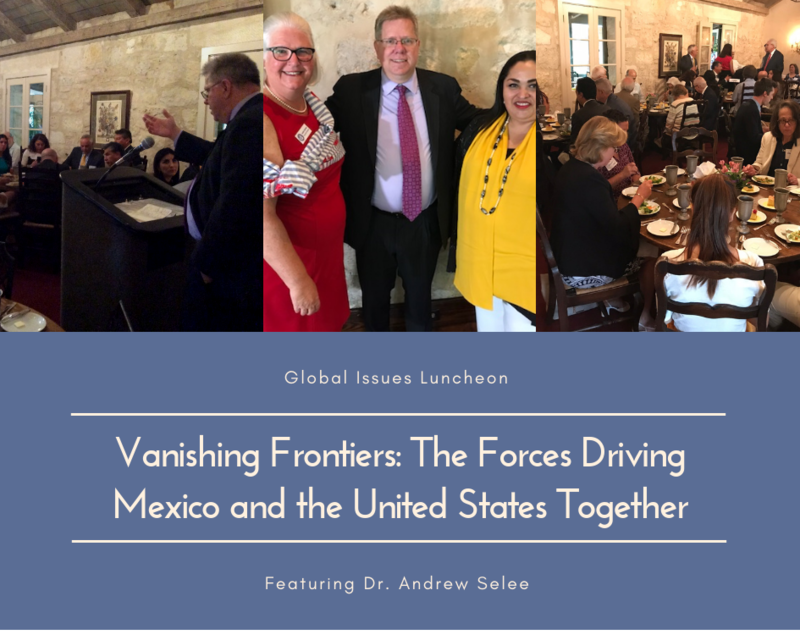 Dr. Selee will speak about his most recent book, “Vanishing Frontiers: The Forces Driving Mexico and the United States Together.” This program is held in partnership with Consulado General de Mexico en San Antonio. Dr. Selee, an expert on immigration issues, as well as US-Mexico relations and Mexican politics, has been President of the Migration Policy Institute since August 2017. Previously he served as Executive Vice President of the Woodrow Wilson Center and as the founding Director of the Center’s Mexico Institute from 2003-2012. He also served as a member of the Council on Foreign Relations’ Task Force on Immigration. Dr. Selee’s recent publications are What Should Think Tanks Do? A Strategic Guide for Policy Impact (Stanford University Press, 2013),Mexico and the United States: The Politics of Partnership (Lynne Rienner, 2013), and Mexico's Democratic Challenges (Stanford University Press/Woodrow Wilson Center Press, 2010). He has written extensively on U.S.-Mexico relations, Mexican politics, U.S. immigration policy, organized crime, and democracy in Latin America.Dr. Selee has regularly taught courses at Johns Hopkins University and George Washington University since 2006 and was a visiting professor at El Colegio de Mexico. Dr. Selee's book will be on sale at the event, with a special signing by the author. Books cost $30.31, and a portion of the proceeds of book sales at this event will be given to the World Affairs Council to aid our mission of expanding and enriching international affairs education in San Antonio.